Scare the pants off: to frighten someone a lot. As you can see in the picture above, the tourist is very frightened of the bear, which is grabbing him by the throat. The man is so scared his pants are coming off. This expression doesn't mean the person's pants actually come off or fall down. It is just an idea that a person would be so scared or frightened they would actually jump out of their pants. My colleague is so quiet that every time she walks over to my desk she scares the pants off me because I can't hear her. Our math teacher scared the pants off the class when she said there was a surprise quiz. Thunderstorms scare the pants off my children and my dogs too. Our American Express bill scared the pants off my husband when he saw our daughter had charged two pairs of $500 designer shoes. Ugh! My girlfriend sometimes wears so much makeup she scares the pants off me. Skiing scared the pants off me and I'm never going to do it again. Turkish cab drivers scare the pants off me. Sometimes they don't even stop at traffic lights! Speaking in public really scares the pants off me so I avoid it as much as I can. Flying used to scare the pants off me but after I learned how safe it is I absolutely love it. "Did you see the Exorcist?" "No way! Those kinds of movies scare the pants off me." Riding with my boyfriend on his motorcycle scares the pants off me. Agggghhhh! Don’t walk up behind us so quietly like that—you scared the pants off us! Have you signed-up for my free newsletter? It's the best way to stay connected and learn about new updates to my website. So who or what scares the pants off you? Hopefully, writing practice sentences doesn't!! Don't be shy. 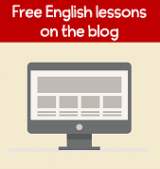 This is a great opportunity for you to practice your English and get feedback on your writing. 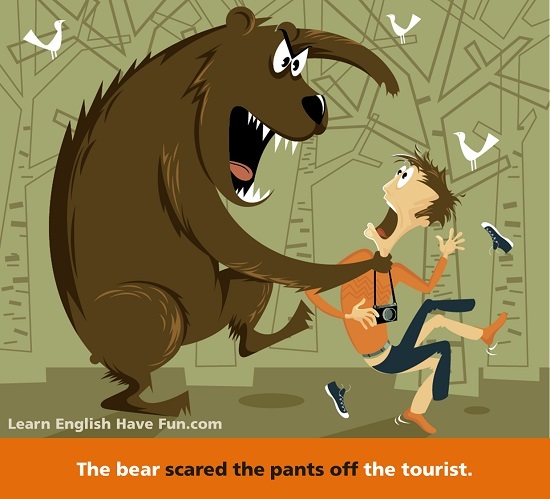 Return from scare the pants off idiom to the main idioms page.